This 3 bedroom 1 ½ reception room semi detached house is located in the exclusive development of St. James's Park. 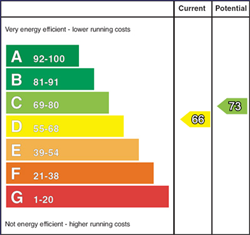 Benefiting from oil fired heating and uPVC double glazed windows. This property is in excellent decorative order throughout and is located close to all the towns amenities and schools. This home will appeal to a wide range of prospective purchasers including investors and families. With spacious living accommodation including ensuite master bedroom and utility room. We as selling agents recommend immediate inspection to fully appreciate this home internally and its location. Garden lad in lawn to front with tarmac driveway. Garden also laid in lawn to rear with boundary fencing. Ensuite master bedroom & utility room. 3 bedroom 1 ½ reception room accommodation. With telephone point, built in cloak space and separate w.c. comprising w.c., wash hand basin with tiled splash back and extractor fan. With open fireplace in Oak surround, cast iron inset and Granite tiled hearth, T.V. point and telephone point. With eye and low level units, tiled between eye and low level units, bowl and a half stainless steel sink unit, Creda integrated oven, Bosch hob, stainless steel extractor tower, plumbed for automatic dishwasher, pan drawers, concealed under lighting, dining space and additional family space with sliding patio doors. With low level units, workbench, single bowl and drainer stainless steel sink unit, space for tumble dryer, plumbed for automatic washing machine and boiler housing. Comprising w.c., wash hand basin with tiled splashback, bath with mixer tap and shower attachment, tiled shower cubicle with Redring Expressions 500 electric shower and tiled floor. With T.V. point, telephone point and Ensuite comprising w.c., wash hand basin with tiled splashback, tiled shower cubicle with Mains Thermostatic shower unit, tiled floor and extractor fan. Garden lad in lawn to front with tarmac driveway. Garden also laid in lawn to rear with boundary fencing. Leave Ballymoney along the Coleraine Road, turn left into the St. James's Development. Follow the road to the end and around to the right. The property is located on the left hand side.